I believe firmly that new (and vet) parents really ought to invest in certain premium products and heirloom quality baby-related pieces and products that can and will stand the test in time, and can be used over and over again as new members of the family join. Such items include the baby glider, crib, stroller, car seat and diaper bag which will endure lots of miles of use and as such, and in my opinion, should be made of the best material, pass the highest value standard and overall be considered a genuine investment — meaning perhaps more money is spent on them. This is true for moms and dads. 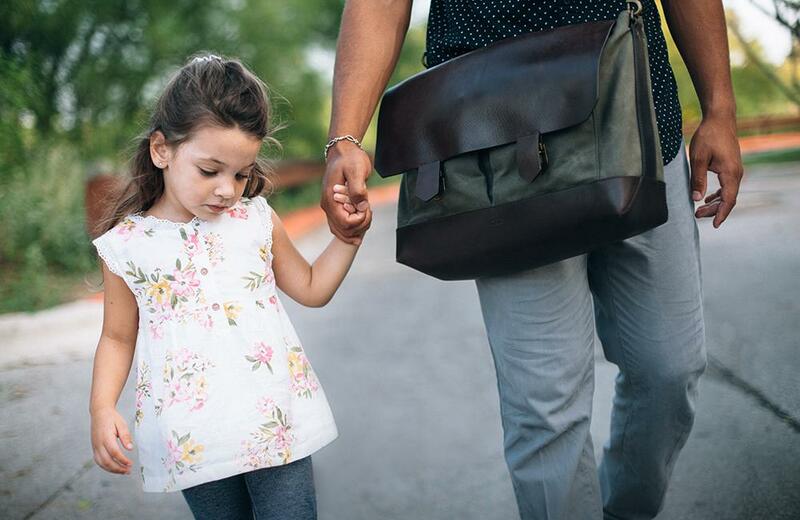 Now, traditionally, a lot of men prefer not to carry around a typical “diaper bag” because they are usually styled for a mom and have extra feminine flare to them. 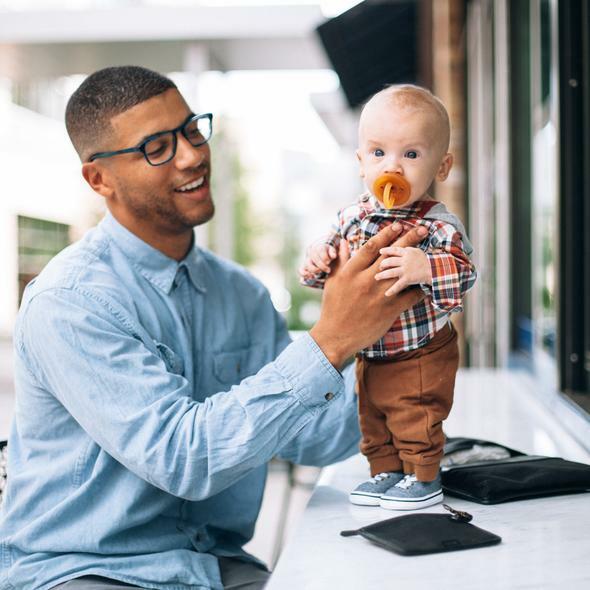 Fortunately for modern Millennial dads and beyond, many brands and companies in recent years have sprouted up to cater specifically to the discerning tastes and needs of dads who prefer sleek, styled yet masculine products for when they’re doing “daddy duty” on the go. 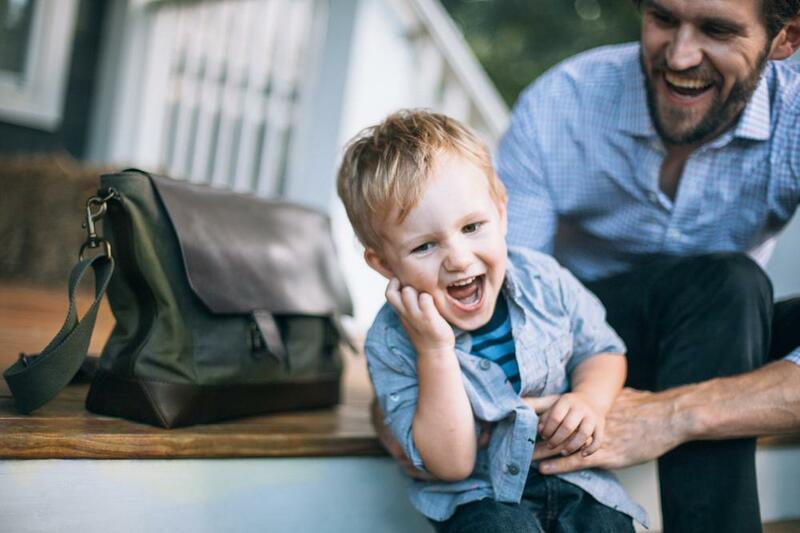 A new brand on the market, Otter Pass fits squarely in that categorization because the products are made with top-of-the line leather, canvas and other materials for the “brand spanking new dad“, and the “dad on-the-go” and we cannot forget, the “old school dad”. 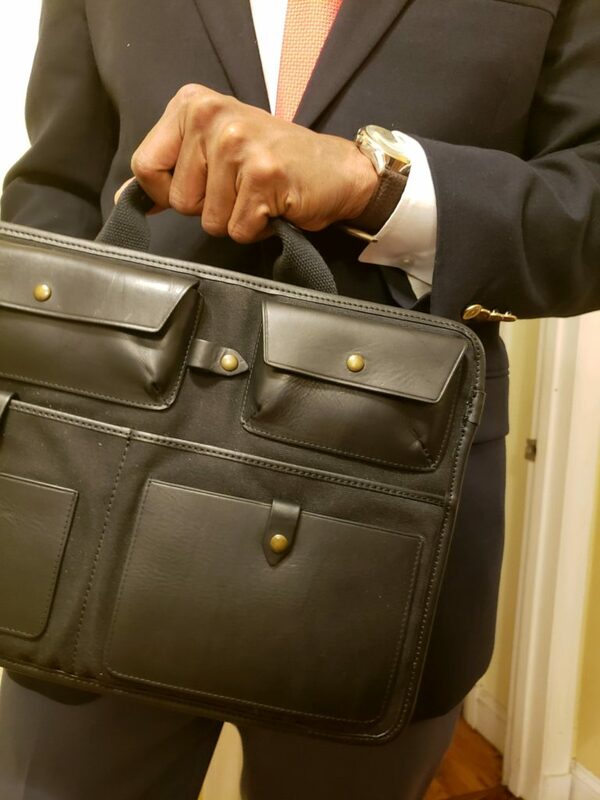 We inspected the Leather and Waxed-Canvas 13″ Laptop Case in black which features a tapered bottom that can be slipped into my husband’s work briefcase yet it is sleek in design on its own that he could stand on its own and be carried to a meeting at headquarters. 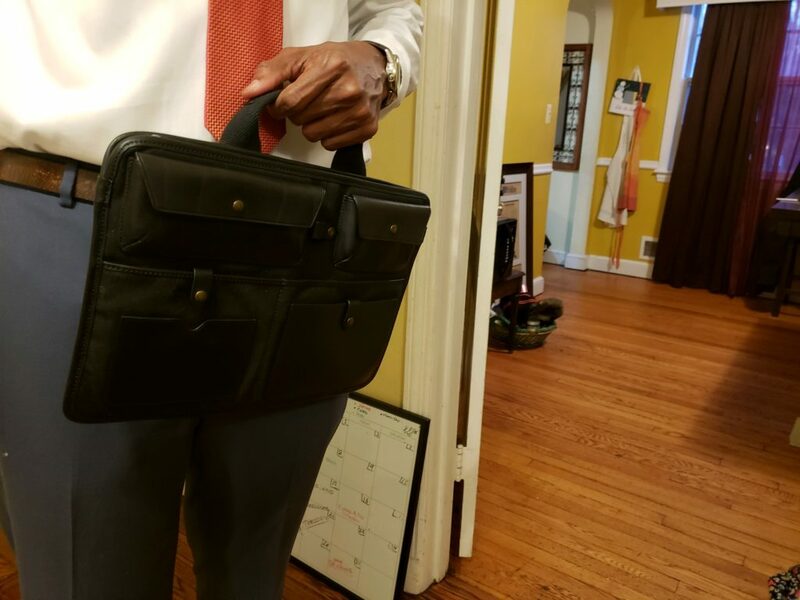 We were able to squeeze in a notepad, his laptop, a few pens and his mobile phone, earbuds, keys and wallet in one of the few pouches. The sleeve retails for $145. If we wanted to go with a complete look, we could slip the sleeve into another item in the Otter Pass executive collection, its messenger bag (retail $245) made up of the same materials with a superb cotton twill interior, featuring an adjustable cotton strap with antique brass finished hardware. *swoon* Did someone say “antique brass*? Now imagine a small portable organizer with a fob to hook onto the bag or, better yet, a pacifier. 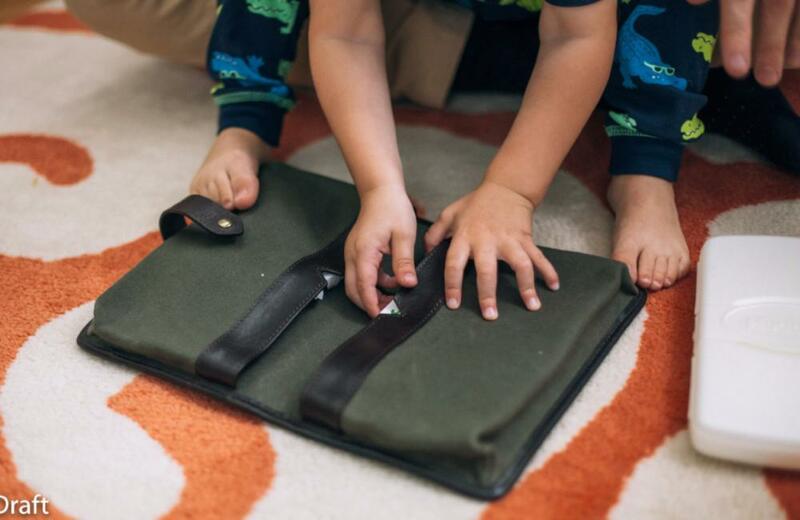 It can stand on its own and hold quick wipes, ID cards, credit and library cards for library story time and every thing needed by a work-from-home or working dad doing weekend duty. I love this brand because of the transparency about the journey its traveled to bring these wonderful products to modern fathers. The Austin, Texas-based company is named for a lodge built on stilts above water called Passo do Lontra in Otter Pass, in the wetlands in far west Brazil. It is where its founder Jonathan Goudeau used to frequent with his brothers learning from their dad how to hook piranhas, avoid the reeds where alligators hid, spot spider monkeys at dawn, and listen for the wing-beats of the jaburu, according to the company’s “about us” page. The company’s name and ideals honors the memory of Goudeau’s dad who sadly perished at the hands of a drunk driver when Goudeau was just 17-years old. 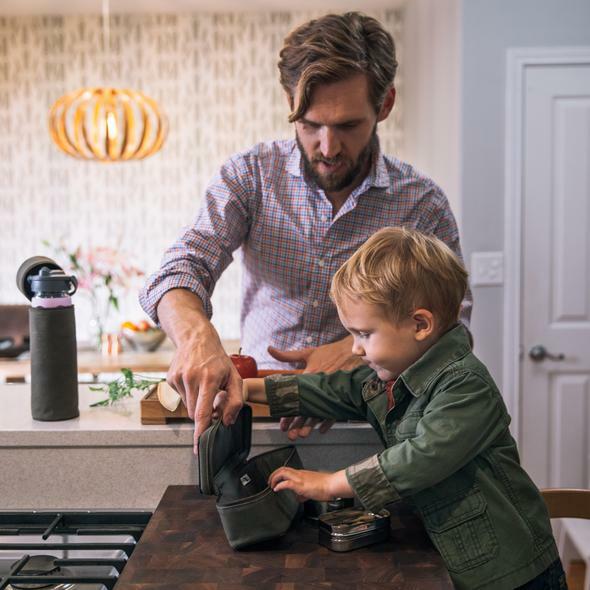 You can sense the connectedness and passion for serving fathers who, according to the company’s mission, are better ready for anything and able to connect with their kids when they are organized and have all the tools they need. 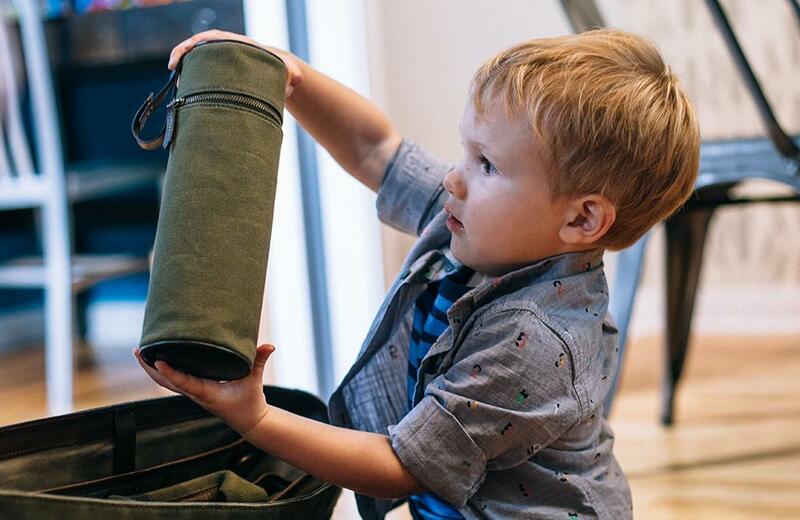 Otter Pass’ collection include everything from wallets and Dopp Kits to hold anything from snacks to shaving supplies, to baby bottle holders to travel cases that are really manly diaper holders! The one-year old brand also has a social conscious and altruistic presence as well. Up until yesterday, December 2, it donated 25% of sales from last Giving Tuesday, November 17 to Refugee groups in Austin, Texas. Right now, if you head over to the company’s website and join the newsletter, you’re going to get 10% off your order! Sweet! We love it so much, we added it to our Gift Guide of things to get that Posh Parent on your Holiday gift list! I love the brand message, history and more to Otter Pass and plan to keep up with it and have followed it on all its social channels! You can too keep up with Otter Pass, the brand, the story and the mission on Instagram, Facebook and Twitter! I can already see that they are out here supporting free trade and challenging slave labor among dis-empowered communities worldwide! Right on! My kind of company! Editorial disclaimer: Product and monetary compensation were provided in exchange for this review, however, my opinions are mine and my review of the products are made without regard to the complimentary nature and the fact the review may be sponsored.